Santorini is an abstract whose miniimalist components give it a striking and unique appearance. 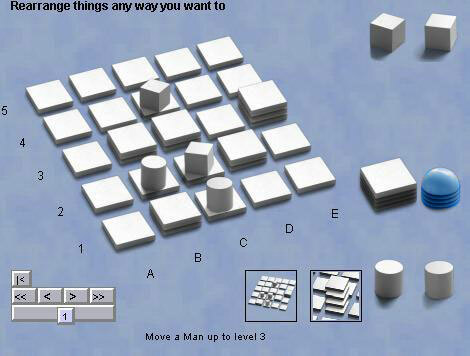 Starting with a 5x5 grid of squares, players manouver two men each and stack more squares, in an effort to ascend to a height of 3 above the base. The base game becomes a little less abstract with the addition of gods and heroes, who alter the rules in the rules of the base game. The official rules are here, but briefly, you first place your men, then each turn you move a man, and build a new square adjacent to the man you moved. You can descend freely, but can only ascend one level at a time. Adding to a third level above the base becomes a dome. A man ascending to the third level wins. If neither of your men can move, you lose. Robots: look pretty fierce to me, but lets see what the experts think. The back story: I chose Santorini mainly based on the strong following at Boardgamegeek, despite being only available in a few small production runs. I consider it one of my "Mentoring" games, where I hope having an online implementation will help it find a publisher.